Tammy and Jodie Campbell at Ackergill Tower. 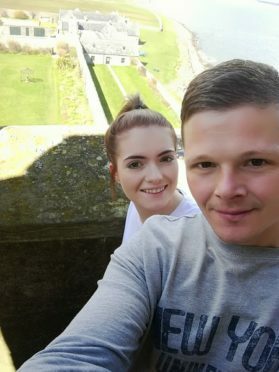 A Highlands couple have spoken of their shock after they were left with no Christmas present to one another following the sudden closure of Ackergill Tower. Jodie Campbell and his wife, Tammy, had booked a stay at the north hotel on Saturday, January 5. The historic venue, beside Wick, has a place in their hearts as they had a mini honeymoon there following their wedding earlier this year. But they have now been left without any gifts for one another – just days before Christmas – as the hotel was closed without warning last week. And the pair say that their frustration has been compounded by the fact that owners, Clarenco, have yet to inform them of the cancellation. Mr Campbell, who works at Invergordon Distillery and lives in the Easter Ross town, only found out about the closure in The Press and Journal. The 35-year-old said: “We have not heard anything from them, we would have just arrived there on the day and found the place abandoned. The pair tied the knot in Inverness at the start of the year and were given a two-night romantic break at Ackergill Tower’s Treehouse in April as a gift. Mr Campbell added: “We thought we would go back once a year, as it became a special place for us and we wanted to make it a tradition on our anniversary.